Hudson Valley Hospital Center is continuing its healthy eating initiative by hosting a monthly series of farmer’s markets on the hospital campus through November. 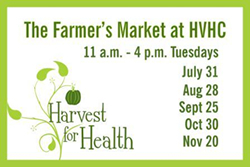 The HVHC Farmer’s Market will be held once a month on Tuesdays in the parking lot fronting on Crompond Road/Route 202, near the Main Entrance to the hospital. Free parking is available. The farmer’s market series is an expansion of Hudson Valley Hospital Center’s Seeds for Health, an educational and therapeutic program for cancer patients and their families. Seeds for Health launched in April 2012 with the opening of the Organic Garden for Healing, serving as the classroom for the program which stresses the importance of nutrition in healing and the therapeutic value of gardening in managing stress and reducing anxiety. HVHC’s Organic Garden for Healing is maintained by patients, employees, and members of the community. The farmer’s market will feature produce grown by local farms, including Bracco Farms, W. Rogowski Farm, Continental Organics, Glynwood Farm, Hemlock Hill Farm, and farm-raised meats from Hilltop Hanover Farm and Environmental Center, and other gourmet items. Staff from HVHC’s Nutrition and Education departments will be on-hand with information to help integrate healthy eating practices into everyday life. Master gardeners from Cornell University Cooperative Extension Westchester County will be available to answer questions about gardening issues. Seeds for Health was inspired by “Think Pink, Live Green,” the brain child of Dr. Marisa Weiss, President and Founder of www.Breastcancer.org. Think Pink, Live Green stresses the importance of lifestyle changes, including healthier eating, as a way to help prevent breast cancer and improve the health of those already diagnosed with the disease. For more information, visit www.hvhc.org. Hospice Care in Westchester & Putnam Caring Circle Children’s Bereavement Program Day Camp. Hospice Care in Westchester & Putnam’s 8th Annual Caring Circle Camp is scheduled for Sunday, August 19th at Camp Kiwi in Carmel, New York. Participants from the Caring Circle and their families will come together for an afternoon of arts and crafts, swimming, sports, games, miniature golf and camaraderie. The camp is offered free of charge to all participants who are responding to the loss of a loved one. Our Caring Circle children and their families take part in one of our three bi-weekly support groups offered in Yonkers, Yorktown Heights and New Rochelle. These groups offer children a safe environment to deal with their emotions in a healthy and productive way so they can begin to heal. For more information, please call Maribel Nazario, Caring Circle Coordinator at (914) 666-4228, ext. 336 or click here. study. Open to kids ages 8 and older who play violin, viola, cello, bass or piano. Chamber music coach, Nicholas Szucs’ vast teaching & performing experience includes Hudson Valley Philharmonic, Norwalk Symphony, NY Gilbert & Sullivan Players, and as String Orchestra Director at Rippowam-Cisqua School. Nick will provide practice techniques, coaching sessions and will oversee rehearsals. The 1st day includes orientation. The following days, students will learn proper rehearsal technique, have practice time and group coaching. Two final performances will be held on Fridays, August 24th & 31st, which will be a culmination of all the techniques the students have learned. Chamber Music Study: August 20th – 24th, (1st week) & August 27th – 31st, (2nd week). Classes will be held Monday – Friday, 9 am – 12 pm daily. Tuition is $200 per week. Instrument chamber music assignments vary from duos to quintets & more. Advanced students may perform in more than one group. Students will get music assignments 1 week before their 1st week of camp. Location: Sun & Moon Health Spa, 155 Route 202, Somers, NY 10589. Call (914) 433-3362 to register now. At Camp Bedford, kids imagine what it would be like to bounce among the clouds, soar with eagles, and reach for the stars. The Bible comes to life in powerful ways as kids explore why nothing is impossible with God. Start soaring now – register to be a part of this exciting camp! This event is free and open to all children entering grades 1-5! Please register online at www.bedfordcommunitychurch.org. For more information, please call (914) 666-5384 or e-mail the children’s ministry at bcckidsny@yahoo.com. Camp CDs, t-shirts and hot dog lunches will be available for purchase. Camp Bedford is located at Bedford Community Church – 160 Bedford Center Road, Bedford Hills, NY 10507. Camp Bedford will be held August 6-10 from 9am – 12noon. Open Door Family Medical Centers Joins with Port Chester Fest to Celebrate Health, Local Art, Diversity, Inclusion, Music, and Culture. On Saturday, August 4, Open Door Family Medical Centers will join forces with the Port Chester / Rye Brook / Town of Rye Council of Community Services to combine their annual Health Fair celebrating National Health Center Week with the annual Port Chester Fest. Utilizing art and music and promoting good health is a powerful and exciting way to celebrate the diversity, culture and wellness of Port Chester as the community joins together in celebration. Port Chester Fest also provides an excellent opportunity to link people with the wide range of community resources that are available. Port Chester Fest will take place from 10am-6pm outside of Open Door on Purdy Street between Church Street and Don Bosco Place. Admission to Port Chester Fest is Free. This year Open Door will join the Port Chester Fest celebration to provide education and screenings on a variety of health concerns including skin safety, nutrition, body mass index (BMI), blood pressure, HIV, optometry, and reproductive health, from 10am-3pm. In addition, the now larger Fest, one of the most widely anticipated local events of the year, will showcases musicians and performers representing many cultures including Brazilian, Jazz, Bolivian, Polish, African, and Mexican. Fun-filled, creative workshops for families will include: the Clay Art Center; Face Painting with Miguel Cossio; Community Art with Tova Snyder; Westchester Children’s Museum; Rye Arts Center; ArtsWestchester Workshop; and Printmaking with Nowodworksi. In addition, there will be performances by local artists, poets, and musicians and delicious international foods and vendors offering a wide range of tasty treats. For more information about Port Chester Fest call 914-939-8055 or visit www.portchesterfest.org. For information about Open Door Family Medical Centers call (914) 502-1339 or visit www.opendoormedical.org. 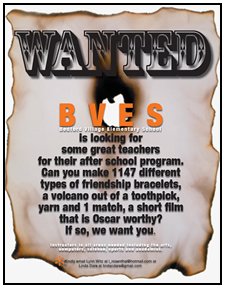 Bedford Village Elementary School (BVES) is looking for some great teachers for their after school program. Can you make 1147 different types of friendship bracelets, a volcano out of a toothpick, yarn and 1 match, a short film that is Oscar worthy? Instructors in all areas needed including the arts, computers, science, sports and academics. Kindly email Lynn Witz at l_rosenthal@hotmail.com or Linda Dare at lindacdare@gmail.com. August 18 & 19, 10 AM – 4 PM at Stone Barns Center for Food & Agriculture. Join us for a weekend of celebrating the height of summer bounty on the farm! Head over to the field to taste our summer veggies, meet our animals with one of our farm apprentices, make your own posie in the Dooryard Garden and more! Click here for a full schedule and to register for programs. (Early registration is highly recommended as programs sell out.) Grow Your Own: Popsicles, Saturday, 8/18 2 PM – 3 PM. Turn a childhood favorite into a refined summer treat. In this class, we will make popsicles with seasonal fruits and herbs. $10/person, ages 5 and up. The A-Bee-C’s of Bees, Saturday, 8/18 12 PM – 1 PM. It’s bee time. Come check out our happy pollinators, taste their honey, and see how well they eat! Bee there or bee square. $10/person, ages 5 and up. Summer Tasting Table & Craft Table, Saturday & Sunday, 12 PM – 3 PM. Taste a selection of the many summer vegetables we grow at Stone Barns and rate your favorite one! Have a favorite summer veggie dish? We’ll be collecting stories and recipes featuring your favorite tastes of summer. FREE. Make Your Own: Posie, Saturday & Sunday, 1 PM – 3 PM. Come join us in the Dooryard Garden to make your very own summer posie using flowers fresh from our Terrace Garden. $5/posie. Summer Scavenger Hunt, Saturday & Sunday, 10 AM – 4 PM. Explore the fields, gardens and pastures at Stone Barns and discover what’s growing. Crack the clues and win a special prize if you find them all! Ages 2 and up. Plus regularly scheduled programs…Hands On: Egg Collecting, Saturday & Sunday, 11 AM – 11:45 AM, 12 PM – 12:45 PM, Ages 2 and up. Hands On: Gardening, Saturday & Sunday, 11 AM – 11:45 AM, Ages 2 and up. Livestock Tours, Saturday & Sunday, 1 PM – 2 PM. Insider’s Tour, Saturday, 11 AM – 12:30 PM, Sunday 2:30 PM – 4 PM. Farm Market, Saturday & Sunday 1 PM – 4 PM. Stone Barns Center for Food & Agriculture, 630 Bedford Road, Pocantico Hills, NY 10591, Phone 914 366 6200, www.stonebarnscenter.org. Saturday, August 18th, 10am to 4pm. Playgroup Theater, One North Broadway, White Plains, NY. Exhibits of natural and eco-friendly products. 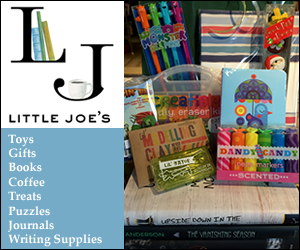 Family event with hourly raffle and face painting. Free admission! The Guidance Center’s Parents Place is hosting Haris Lender and KIDDING AROUND YOGA Teacher Training. September 7, 8, & 9, 2012 At Parents Place, 2 Central Ave., Tarrytown, NY 10591. You must attend all three days for certification. If you are a Yoga teacher, babysitter, play therapist, school teacher, OT, or anybody who works with children, including children with special needs, check out our website for the upcoming 3 day training in your town. Yoga is stress management for kids and we want to share this with you! Go to the website to register: www.kiddingaroundyoga.com. For questions email: dmorrison@theguidancecenter.org. Blind author hosts book signing to benefit Guiding Eyes. Wednesday, August 8. Pleasantville native, author Peter Altschul, will host a special book signing to benefit Guiding Eyes for the Blind in honor of International Assistance Dog Week. Altschul will sign copies of his compelling memoir, Breaking Barriers: Working and Loving While Blind, which will be available for purchase at the event. The Village Bookstore, 10 Washington Ave., Pleasantville. 6PM-8PM. All ages. For more information, call 914-243-2208. Our Wednesday night Children’s Series continues to be the best outdoor festival for the younger set! We proudly present today’s most acclaimed children’s performers and bands. The series features programs that are as smart and engaging as they are fun: kids dance and sing, parents also enjoy the entertainment! All Wednesdays in the Series are FREE. 2012 Children’s Series: Wednesdays from June 27 – August 22 at 7PM (no show July 4). Pavilion opens at 6PM for complimentary face-painting before free Children’s Shows! Wednesday, August 1 @ 7pm : PBS KIDS’ MR. STEVE. Steve Roslonek of SteveSongs has been writing and performing his award-winning music for kids and families for the past eleven years. Steve blends participatory songs, clever stories and great melodies to create what the Boston Globe called “not just a musical journey but an entertaining, interactive and educational one.” In May 2008, Steve took on the exciting new role of “Mr. Steve,” cohost of the PBS KIDS preschool destination that features the popular shows Curious George, Clifford the Big Red Dog, Dragon Tales, and Super Why. Steve performs original interactive songs that reinforce the day’s curriculum theme. Wednesday, August 8 @ 7pm : BRADY RYMER & THE LITTLE BAND THAT COULD. Grammy Award nominee Brady Rymer was a founding member of the RCA roots/rock band From Good Homes, touring and recording with them for 13 years – and sharing the stage with the likes of Bob Dylan and Dave Matthews – before parenthood brought him off the road and into the world of children’s music. Brady performs for families throughout the country with his Little Band That Could as a trio or in a full band format, rocking out with good-times musical celebrations filled with a powerful love and respect for children. Wednesday, August 15 @ 7pm : Bari Koral Family Rock Band. Bari’s songs are a huge hit with children and adults. Her catchy, pop friendly tunes, interactive live shows & top 10 songs on Sirius XM Kids Place Live have gained her and her band many thousands of young (and not so young!) fans. Also a children’s yoga and music and movement specialist, Bari is also known for writing great music & movement songs for children. Wednesday, August 22 @ 7pm : DEBBIE AND FRIENDS. Children’s entertainer Debbie Cavalier of Debbie and Friends uses original songs to tell stories that children know and love. With the recent release of her debut CD, Story Songs and Sing Alongs, Debbie has made a splash in the children and family music world. Debbie has been making music with kids for over 20 years. She has worked with some of the world’s greatest icons in children’s music entertainment and education throughout her music publishing tenure. These pillars of children’s music include Shari Lewis, Buffalo Bob Smith of Howdy Doody, and Sesame Street-famed music teacher, Bob McGrath. Their influence on her songwriting and her creative approach to sharing music with children is evident. A live Debbie and Friends show is a trip for the entire family—a joyful jaunt through a variety of styles, from straight-ahead pop, to country, to rock, to reggae, all delivered by a band of musicians who are clearly there because they love it. TIPS FOR SUMMER LIVING AT THE PAVILION: For lawn seating, bring blanket and /or lawn chairs. The park opens for pre-show picnicking approximately 60 minutes before showtime. There is also an on-site concession with snacks and ice cream. The Pavilion is located at 40 Jesup Road in Downtown Westport. The Levitt Pavilion for the Performing Arts is dedicated to providing FREE and abundant access to the performing arts, presenting a dynamic and diverse constellation of established and emerging artists – all of whom are paid, and preserving a beautiful outdoor community destination where people of all ages and backgrounds are always welcome to enjoy the arts, enjoy nature, and enjoy each other. The Summer Season runs over the course of 10 weeks, from late June through early September, and presents a vibrant range of music, featuring established and award-winning artists as well as emerging ones, from local bands to national and international acts, plus a mix of other performing arts including dance, comedy and more. Every summer also includes the acclaimed Children’s Series on Wednesdays; and for movers and shakers, there’s RiverSwing – an annual series of six or more evenings sprinkled throughout the season on which the Pavilion offers free pre-concert dance lessons led by professionals in the style of the music about to be enjoyed. For tickets, show information and more, visit www.levittpavilion.com. Teatown Lake Reservation’s 875-acre nature preserve spans into three towns (Yorktown, Cortlandt and New Castle) located in the northwest section of Westchester County. The property provides a unique glimpse of the biological diversity and fragile ecosystem of the entire Hudson Hills and Highlands bioregion. Visitors are awed by the beauty of the preserve, which includes streams, hardwood swamps, mixed forests, meadows, hemlock forests, laurel groves and a scenic gorge. There are nearly 15 miles of hiking trails marked throughout Teatown’s preserve for visitors to traverse and enjoy. The trails are open daily from dawn to dusk, 365 days a year. Teatown’s Nature Center houses nature education exhibits and a live animal collection of a variety of amphibians, reptiles, birds of prey, and mammals. The Nature Center is open Tuesday through Sunday, 9:00am to 5:00pm. Saturday, August 4, 7:30pm-9:00pm, Gone Batty. Bats are amazing little mammals that help keep insect populations in check. Sadly New York’s bat populations are in peril. Come learn about bats and the white-nose syndrome. We’ll head outside at dusk to listen for bats with our bat-detector device. Please note this program is for families with children over 6-years-old. Free for members; $5pp for non-members. Call 914-762-2912 x110 to make a reservation. Saturday, August 5, 10:00am-11:30am, Animals Incognito. Camouflage plays an important role in nature, and for some animals it is their best defense against predators. Come meet some of Teatown’s most elusive critters. Afterwards we’ll take a short hike outside to play a game to test your cryptic capabilities! Free for members; $5pp for non-members. Call 914-762-2912 x110 to make a reservation. Plein Air Painting Workshop. August 6-10, 9:30am-12:30pm. Spend a day or all week working alongside Teatown’s artist-in-residence, Melanie Kozol. Open to all students who have some familiarity with either oil painting, watercolors, pastels or drawing, this workshop uses the beautiful backdrop of Teatown as inspiration. Participants can choose to register for the day or the entire week. Class fees are $20/day or $75 for the week. Registration is open until July 30, 2012. Call 914-762-2912 x110 to make a reservation. Crow Play. Saturday August 18, 1:00 pm-2:30 pm. Did you know that crows are so intelligent that some refer to them as “flying monkeys?” Come learn what makes these feathered bird brains tick by making crow enrichment toys with us. We’ll then take our creative inventions to their enclosure and watch how the crows interact with them. Free for members; $5pp for non-members. Call 914-762-2912 x110 to make a reservation. Sunday, August 19, 1:00pm-2:30pm, Unbeatable Beaks. A bird is a bird is a bird–right? Find out about the adaptations of some local birds by looking at what they eat and how they do it. This interactive program will have you skimming like a duck, sipping like a hummingbird, and pounding like a woodpecker. Free for members; $5pp for non-members. Call 914-762-2912 x110 to make a reservation. Saturday, August 25, 10:00-11:30am, It’s Turtle Time! Come meet Teatown’s turtle ambassadors, and all that’s involved in proper turtle care from enclosure size, design, heat, lights, diet etc. Come with questions or curiosity. We’ll even head outdoors together for some enrichment with Clifford the tortoise. Free for members; $5pp for non-members. Call 914-762-2912 x110 to make a reservation. Animal Adventures: Scavengers and Decomposers. Sunday, August 26, 1:00–2:00pm. Meet a few of Teatown’s animal ambassadors in this program featuring local scavengers. Free for members; $5 per child for non-members. Call 914-762-2912 x110 to make a reservation. Visit www.teatown.org for more information. The WJCS Parent-Child Home Program (PCHP) is currently recruiting part-time visitors, who receive a stipend, for the new program year (October – May). This meaningful and exciting work requires a minimum commitment of nine hours per week. Although Home Visitors’ hours are flexible, attendance is required at weekly staff/training meetings held on Wednesday mornings at WJCS, 141 North Central Avenue, Hartsdale. Staff Training will be held the first week of October. For 40 years the Parent-Child Home Program has been serving low-income families in White Plains, Port Chester, New Rochelle, Mamaroneck, Greenburgh and Mt. Vernon. Visitors call on parents and children in their homes for a half hour, twice weekly, beginning when the child is about two years old. Each week, the Home Visitor brings a book or toy and in the comfort of the family’s home, parent, child and home visitor participate in fun and stimulating activities using the book or toy. The Home Visitor models verbal interaction – reading, conversation, and play – designed to develop language and literacy skills. Home Visitors need no special educational background but must have a personality suited to home visiting and working with parents and toddler-aged children. Prior to beginning home visits, Home Visitors participate in 16 hours of training. For further information, contact PCHP Director Patrice Cuddy at 914-949-7699 ext. 324 or pcuddy@wjcs.com. ArtsWestchester and R.A.R.E (Rare Animals Really Endangered) Present Fish Tales Around Westchester. On view through August 11th. Through the work of 20 artists, “Fish Tales Around Westchester” transforms ArtsWestchester’s gallery into a stimulating fantasy sea environment where guests, including children, are encouraged to participate in art-making and role-playing workshops. The exhibition will help guests to explore the Hudson River’s abundant past and better understand mankind’s impact on its future. For more information on the interactive Fish Tales exhibition, go to www.artsw.org/fishtales. Special workshop: Saturday, August 4: The Journey of the American Eel, 1:00-3:00pm. Meet a live eel and learn about the incredible migration of the American eel, map their journey, and paint a picture telling the story of your eel. Lead by Sarah Mount of Norrie Point Environmental Center. Held at ArtsWestchester within our gallery, located at 31 Mamaroneck Avenue, White Plains, NY.